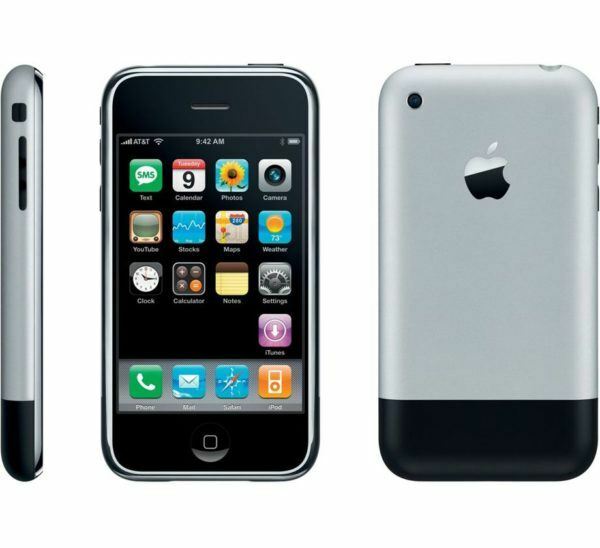 The Apple iPhone 1st Generation (the original iPhone, EDGE, iPhone 1,1) combines mobile phone, Internet communications, iPod and other functionalities. The original iPhone introduced a multi-touch interface (control of the functions by dragging finger across the glass display). 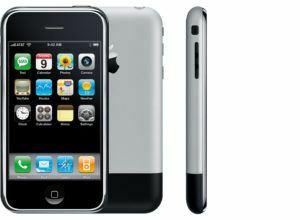 The first iPhone is also referred to as the iPhone 2G because it doesn’t support 3G networks. – 4GB model on January 9, 2007. – 16GB model on February 5, 2008. Released on June 29, 2007. Processors: Geekbench 2 (32). Geekbench 3 (32). Geekbench 3 (64). Processor Type: Samsung ARM 11. Storage capacity: 4, 8 and 16 GB of flash memory. Core Design: ARM1176 x 1. OS: Mac OS X 10.4.10. iPhone OS 1.0 (1A543a). iPhone OS 3.1.3. Windows Support: (compatible with a PC with USB 2.0): Windows Vista Home Premium, Business, Enterprise, Ultimate Edition. Windows XP Home, Professional with Service Pack 2 or later, iTunes 7.3 or later. Usage time: Standby time – up to 250 hours. Talk time up to 8 hours. Audio time (audio playback) – up to 24 hours. Video time (video playback) – up to 7 hours. Internet Web browsing up to 6 hours. Display: 3.5-inch display with 320×480 resolution at 163 ppi. Connectivity: Built-in support for Wi-Fi (802.11b/g), EDGE, Bluetooth 2.0 EDR. USB. Dock and Headphone ports. Audio Support: AAC, Protected AAC, MP3, MP3 VBR, Audible (formats 1, 2, and 3), Apple Lossless, AIFF, WAV. Photo: 2.0 megapixel rear camera. Photo Support: JPG, GIF, TIFF images, the iPod function of the iPhone supports images synchronized from iTunes. Video Support: H.264 video, up to 1.5 Mbps, 640 by 480 pixels, 30 frames per second, Low-Complexity version of the H.264 Baseline Profile with AAC-LC audio up to 160 Kbps, 48kHz, stereo audio in .m4v, .mp4, and .mov file formats; H.264 video, up to 768 Kbps, 320 by 240 pixels, 30 frames per second, Baseline Profile up to Level 1.3 with AAC-LC audio up to 160 Kbps, 48kHz, stereo audio in .m4v, .mp4, and .mov file formats; MPEG-4 video, up to 2.5 Mbps, 640 by 480 pixels, 30 frames per second, Simple Profile with AAC-LC audio up to 160 Kbps, 48kHz, stereo audio in .m4v, .mp4, .mov file formats. Dimensions: 4.5 x 2.4 x 0.46. Battery: Lithium ion battery. Power – 5,18 Wh. Current: 1400 mA. Voltage – 3,7V. MA501LL/A for the 4 GB configuration. MA712LL/A for the 8 GB configuration. MB384LL/A for the 16 GB configuration. 4 GB model on September 5, 2007. 8 GB model on June 9, 2008. Initial price: $599, requiring a 2-year contact with AT&T. Final price: $399, still requiring a 2-year contract with AT&T. Accessories: Shipped with a stereo headset, dock, dock connector to USB cable, USB power adapter, a cleaning cloth. Although iPhone original ran preinstalled iPhone 1.0 OS, Apple didn’t referred to this OS as iPhone OS till March 17, 2009, as it was called OS X (not the same as Mac OS X) before. On June 7, 2010, Apple changed the name to iOS. The original iPhone does not offer a disk mode for file transfer. 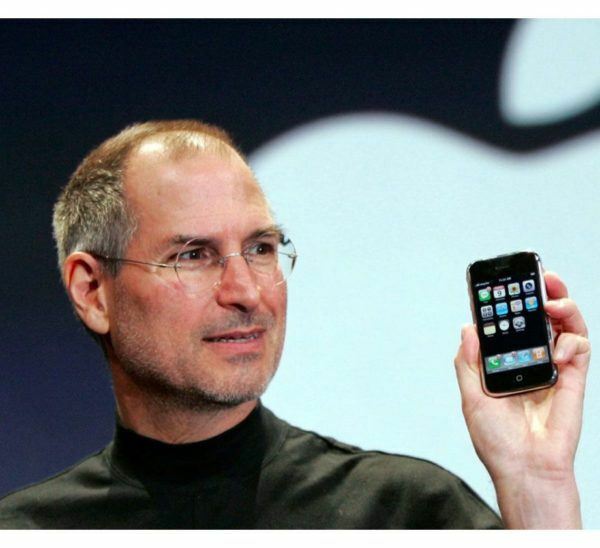 Apple created its first smartphone during a secretive collaboration with AT&T, formerly Cingular Wireless. The development cost of the collaboration was estimated to have been $150 million over a thirty-month period. Apple rejected the “design by committee” approach that had yielded the Motorola ROKR E1, a largely unsuccessful collaboration with Motorola. 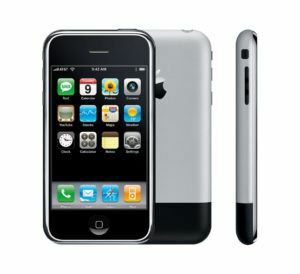 Instead, Cingular Wireless gave Apple the liberty to develop the iPhone’s hardware and software in-house. The original operating system for the original iPhone was iPhone OS 1 (marketed as OS X). This operating system included Visual Voicemail, multi-touch gestures, HTML email, Safari web browser, threaded text messaging, and YouTube. However, many features like MMS, apps, and copy and paste were not supported at release. Hackers added these features to their iPhones by themselves. Later Apple slowly added to its software these features officially. Apple’s iPhone 1,1 multi-touch interface allows users to control the functions of the system by dragging fingers across the glass display for the first time in history.The first iPhone has an accelerometer and switches automatically accordingly depending on how the smartphone is held:in landscape or portrait mode. The iPhone 1st Generation price was around $399 when it was first released, although now Apple have released four other versions of the iPhone, and it was thus available much cheaper with some good research. iPhone 1,1 has an ambient light sensor to adjust screen brightness based on the need. Another sensor, a proximity sensor, turns off the display when it is held to the ear. The New York Times and The Wall Street Journal published positive, but cautious, reviews of the iPhone, their primary criticisms being the relatively slow speed of the AT&T’s 2.5G EDGE network and the phone’s inability to connect using 3G services. The Wall Street Journal‘s technology columnist, Walt Mossberg, concluded that “despite some flaws and feature omissions, the iPhone is, on balance, a beautiful and breakthrough handheld computer.” Time magazine named it the Invention of the Year in 2007. Sell your old iPhone for the best price. We at iGotOffer.com buy even broken smartphones for fast cash, free instant quote, free shipping, fast payment. iPhone User Guide for iOS 3.1 Software (in PDF format).